Television reviews are not usually within our purview. But this month, happily, something interesting is happening in public broadcasting that invites some civility discussion. PBS, together with Boston’s WGBH, have premiered a new show called Point Taken that’s a version of a panel debate. But far from the Crossfires of the world, this debate isn’t about scoring partisan points. The show bills itself as an exploration of all sides of a key issue; and it emphasizes good listening, the determination of fact, and (perhaps most encouragingly) the search for merit in opposing arguments. Point Taken is hosted by Carlos Watson: journalist, media entrepreneur, and founder of ozy.com. Each episode features a panel of four journalists and experts – two on the ‘pro’ side of a given issue, and two on the ‘con.’ The first episode, for example, had journalists Matt Welch and Isabel Wilkerson defending the position that the American Dream is alive and well. While columnist Tom Shattuck and financial expert Monica Metha argued that its expiration date has come and gone. But the show adds some new features to the old back and forth. Watson and company survey their studio audience at the beginning and end of each debate to determine what they think about the issue at hand, and how many minds have been changed because of what they’ve heard. And Point Taken has partnered with the Marist Institute for Public Opinion to provide broader polling data that frames the debate in each episode. In the most recent episode, which was on the subject of refugees, Marist polled on two questions: whether the United States should accept more or fewer refugees, and whether the United States has a moral obligation to accept refugees. Both questions became topics that the panel discussed. And the seemingly conflicting response – the fact that a majority thought that America does have a moral obligation, but that it still should accept fewer refugees – became a topic of discussion, too. The show also takes a break from the debate in the middle to do what it calls fact checking. In the episode about refugees, for instance, Watson asked the panel how many refugees the United States accepted in 2015; and he asked them which countries accept the most refugees by percentage of their population. The segment runs something like a miniature trivia contest, and Watson even joked that it should feature the Jeopardy music in the background. But it serves two important functions: it shows off panel members’ level of expertise (and therefore helps audiences gauge their credibility); and it makes sure that audiences understand at least the basic facts of the topic at hand. The level of respect is one of the show’s more exciting features. Panelists seem to come from all sides of the political spectrum, and they are drawn from a pool that is purposefully diverse both in professional and demographic make-up. And yet, though each of the participants certainly seems passionate about his or her point of view, that passion never translates into raised voices. It never translates into ad hominem attacks, or mocking, or patronizing responses, or even a shift onto obvious talking points. Instead, panelists’ answers are calm and detailed. And they respond to the substance of the question, or directly to what their colleagues have said. Panelists do sometimes try to talk over each other. In both the episode about refugees and the one about the American Dream, as the show’s half hour wound down all sides seemed to want to get in one last point. But Carlos Watson’s strength as a moderator is keeping the peace; and he skillfully deescalated burgeoning tensions with a mixture of well-placed interjections and strategic changes in topic. Even more encouraging than its tone, however, is the show’s ending. 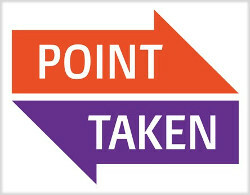 Point Taken takes its name from each episode’s final move, where panelists on one side of an issue must explicitly address the fact that there’s something to the other side’s argument. In the American Dream debate, for example, Tom Shattuck, who had been arguing that the Dream is dead, acknowledges that the debate has caused him to think about minorities’ relationship with the concept, especially given that for many prosperity has been long in coming, and some are only just starting to see it now. And Isabel Wilkerson, speaking for the pro-Dream side, similarly acknowledged that many Americans do feel a loss – do feel disheartened – by the perception that their generation is not as prosperous as their parents’. @ashhar_quraishi Great job on #PointTakenPBS. I love adults that can talk without screaming at each other. @PBS THANKS AGAIN. Is Point Taken perfect? No. Debate is a necessary feature of our democracy, but it is also, by its nature, more adversarial than collaborative. The show tries to sand down some of the format’s rougher edges through good moderation and through its unique approach to closing statements. But there are other formats, like the dialogue approach that the Institute applies in its own Congressional Student Forums, that might better serve the purpose of lifting up public discourse. Yet that said, Point Taken does a lot of things right. It’s informative; it promotes civic engagement through citizen education; and perhaps above all, it models the idea that we can have extensive disagreements about important issues and not only come away amicably, but come away with the idea that though we may not agree with the other side, they have good reasons for believing the way they do. And with so much television out there that seems to prefer the self-serving, the partisan, and the polarizing, all of this makes Point Taken something of a breath of fresh air. If you’re interested in watching Point Taken, you can find full episodes here. Thanks for the nice writeup! We look forward to seeing what you think about our next episode asking is college worth the price tag. Evie Kintzer liked this on Facebook. Natalie Dudas-Thomas liked this on Facebook.